This beautiful picture, which was obtained by the NASA - Cassini Spacecraft on October, 14, 2015, shows us some heavily Battered Terrain located around the North Pole of the Saturnian (really) Icy moon Enceladus. Many Unnamed Impact Craters crowd and overlap one other, each one recording an impact that occurred in the moon's distant past. Enceladus' North Pole lies approximately at the top of the view, taken by the NASA - Cassini Spacecraft's Wide-Angle Camera. The image was taken in visible light by the NASA - Cassini Spacecraft and it was acquired at a distance of approximately 4000 miles (such as about 6437,36 Km) from the Surface of Enceladus and at a Sun-Enceladus-Cassini Spacecraft, or Phase, Angle of 8�. The image scale is roughly 1093 feet (such as approx. 333,1464 meters) per pixel. 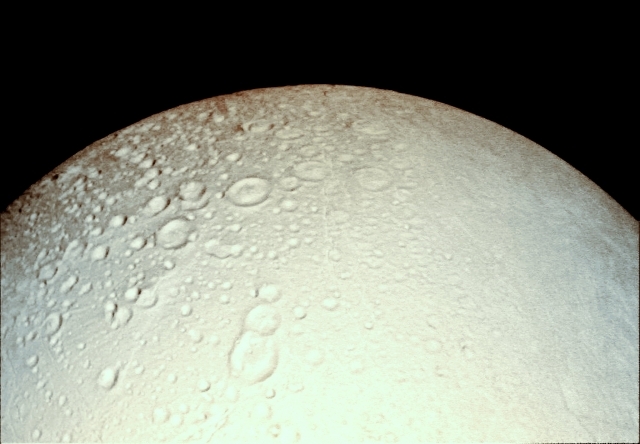 This frame has been colorized in Absolute Natural Colors by (such as the colors that a human eye would actually perceive if someone were onboard the NASA - Cassini Spacecraft and then looked towards the North Polar Regions of the Saturnian moon Enceladus), according to an educated guess carried out by Dr Paolo C. Fienga/LXTT/IPF, by using an original technique created - and, in time, dramatically emproved - by the Lunar Explorer Italia Team.